Description: SSJ's "Jazz Legends in Europe" series! World premier release on CD! 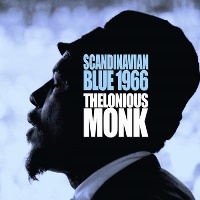 The Thelonious Monk Quartet made an extensive concert tour of Europe in March and April 1966. The quartet was videotaped for broadcast on the afternoon of April 15 before their concert that night in Oslo, Norway. On April 18, the group performed again, this time for Danish TV in their studios in Copenhagen. This CD consists of three track each from the Oslo and Copenhagen sessons. The golden quartet, with Charlie Rouse on tenor sax, Larry Gales on bass and Ben Riley on drums, is in top form, and each player shines at a very high level. Monk plays "Don't Blame Me" on solo piano as he did on his album Criss-Cross. Recorded April 15, 1966 in Oslo, Norway (Tracks 1-3); April 18, 1966 in Copenhagen, Denmark (Tracks 4-6). Mono.